We decided to visit a few new-to-us places over in the Shenandoah Valley on the Fourth of July this year. It was going to be a hot day, so we started out at 6:05 AM to be able to enjoy the cool Virginia mornings by the Blue Ridge Mountains. By the time the heat was beginning to swell, we were at Shenandoah Caverns to enjoy an amazing journey beneath the earth at 56 degrees. 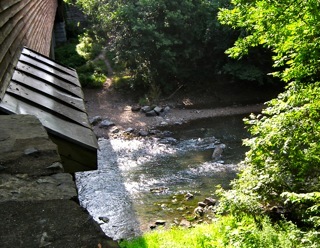 However, prior to that, we visited the longest covered bridge in Virginia that was part of the Strathmore Estate. The bridge was built in 1894 after many bridges had been destroyed during the Civil War. This bridge spans the gorgeous North Fork of the Shenandoah River. The bridge is aptly named after the Meem Family that owned the beautiful Strathmore property. The actual mansion, which is a short distance from the bridge, is now Strathmore Bed & Breakfast. 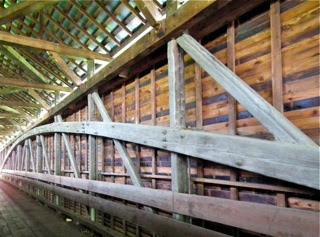 The Meems Covered Bridge photo album has more historical information about the bridge. You will also find out several reasons why they built covered bridges during this time.